Noon concert - presentation of Rudrā Vīņā at the BHU. This is the final section of a performance of Bahauddin Dagar playing Rudrā Vīņā. The performance (noon - afternoon Rāga Bhīmpalashī was performed) at the Pt. Omkarnath Thakur Auditorium, Faculty of Performing Arts, BHU, 13/02/2009. Bahauddin Dagar follows the Dhrupada-style of elaborating a Rāga, this is why he is accompanied by the Pakhāwaj and not by a Tablā. The Tāla (rhythmic cycle) is the 12-Mātrā (beat) Cautāla. 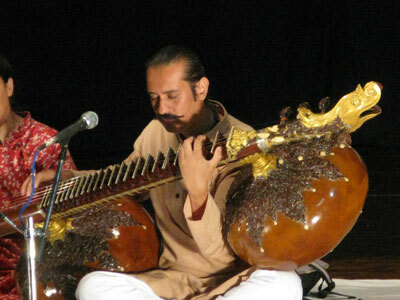 Bahauddin Dagar playing Rudrā Vīņā in a performance (noon - afternoon Raga Bhimpalashi was performed) at the Pt. Omkarnath Thakur Auditorium, Faculty of Performing Arts, BHU, 13/02/2009.